A month after the attack in Paris on a concert by Eagles of Death Metal, prominent rock bands are covering one of the band’s songs to raise money for the victims. “We are calling upon our friends to donate their time, talent and goodwill in a show of solidarity to help the victims of these atrocious acts in Paris and those affected by terrorism worldwide,” the band said in a statement. Thirteen bands have already taken up the challenge including two rock groups that had number-one albums in the United States this year — Imagine Dragons and Florence and the Machine, who collaborated on the song with fellow British rockers The Maccabees. Other prominent bands that released covers of “I Love You All the Time” included Jimmy Eat World, Kings of Leon and My Morning Jacket. Eagles of Death Metal offered links on their website to buy or stream the cover tracks and said that all royalties would go to the Sweet Stuff Foundation, which was set up by band co-founder Josh Homme to support needy musicians but has been transformed into a charity for survivors of the Paris attacks and the victims’ families. Ninety people were killed on November 13 when Islamist extremists attacked the band’s concert at the Bataclan hall in Paris, the deadliest in a series of coordinated assaults around the French capital. 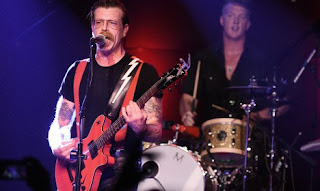 While many of the initial covers are similar in style, Eagles of Death Metal said they welcomed artists of vastly different genres recording “I Love You All the Time” — or choosing another song if they prefer. “Whether your version is faithful to ours, instrumental, uses only lyrics or fragments thereof or is completely reimagined in every way, it matters not. Your individual musical differences become our collective strength,” the band wrote. “I Love You All the Time,” a bluesy rock song, appears on “Zipper Down,” the band’s latest album that came out in October. A song about a breakup, “I Love You All the Time” has no lyrics that are obviously relevant to the Paris tragedy although several lines are in simple French, such as “Tu ne reponds pas / Dis-moi pourquoi” (“You don’t answer / Tell me why”). Eagles of Death Metal plan to resume a European tour on February 13 in Stockholm, playing three days later in Paris.